These Hormann galvanised steel, with horizontal ribs, are pre framed at the factory to ensure the strongest garage door for every day use. This ensures that they will work perfectly time after time. As they are made by Hormann, Europe’s largest garage door manufacturer, you can be sure they will be reliable. Supplied as standard in Powder coated white there is an option for other colours as well as in a wood grain finish. There is bound to be a colour to suit. 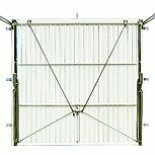 When you are looking for a garage door which is a little special then the Georgian garage door, made by Hormann, in galvanised steel and pre framed at the factory to ensure the strongest garage door for every day use. It’s important the garage door works perfectly time after time and this will fit the bill. Supplied as standard in Powder coated white there is an option for other colours as well as in a wood grain finish. There is bound to be a colour to suit. Take a look at the Marquess garage door and it will suit many of the stylish Lidget Compton concrete garages. This garage door is pre-framed for strength. 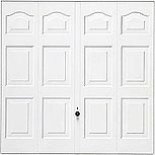 A very reliable and attractive door for your garage. 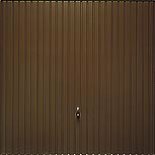 This shows an example of a coloured vertical ribbed concrete garage door. 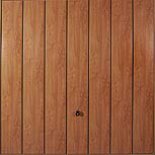 Also available in five other colours as well as two woodgrain effect doors. Made by Hormann, who is the largest and most renowned garage door manufacturer in Europe. Whilst white always takes some beating it’s good to have a choice so the door reflects what you would like. These Decograin wood effect concrete garage doors helps to make your garage blend into your garden as well as making it look stunning. Two different wood effects for you to choose from for your garage, either, Golden Oak or Rosewood. Both of these colours can work very well on your new concrete garage. Made by Hormann Garage Doors which means long life is assured. Whilst the standard locking system on these concrete garage doors is inherently good you can upgrade the security of your garage with the addition of a four point locking system. Available as an option on all concrete garages up to, and including, 9ft wide models. Backed up with a 10 year guarantee from Hormann, the concrete garage door European leaders in the industry. It may be that you prefer something different to the normal ‘up and over’ garage door. 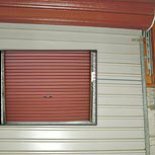 In this instance there is an option for a roller shutter door. Made from heavy steel and then coated in PVC for long life. One of the virtues is that you can park right up to your concrete garage with no problem. 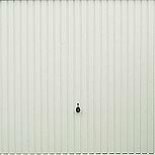 With a number of colours, as well as window option, these garage doors may be what you have been looking for. Please note that on Apex garages you will need to specify heavy height option at an extra cost. Some people like the idea of a timber garage. 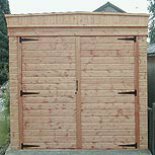 With the Lidget Compton concrete garage there are various options for your new garage to be more like a timber garage. Add in the timber side doors to your building and, who would know the difference? Clearly Lidget appreciates that the customer is king and try to offer an option to suit everyone. 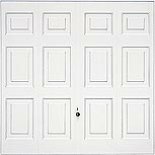 On a cold, windy day wouldn’t it be good for your concrete garage door to open and allow you to drive straight in out of the rain. Well Lidget concrete garages have an option to do this. Their remote controlled operator allows you to press a button from your car and ‘open sez me’ (or words to that effect) This option also adds to the security as the door will be in the locked position automatically. Bear in mind that with the remote controlled garage door that it’s recommended that you have a side door as well for access. Failing that please specify an internal switch and key operated override.